In March 2015, the French government passed legislation stipulating that all new properties within commercial zones must have green roofs; that is, roofs that are at least partially covered in either plants or solar panels. How can London learn from this leadership? It’s not a new concept. In 1926 renowned architect, planner and designer ‘Le Corbusier’ recommended rooftop gardens in his architectural manifesto ‘Five Points of Architecture’. In more recent times French architect Jean Nouvel has incorporated green walls and roofs into his designs for public buildings such as the Musée du Quai Branly in Paris, and the new town hall in Montpellier. Both have received great acclaim. Roof gardens are receiving similar respect elsewhere in the world too. In Switzerland, as long as the roof in question has a suitable pitch, it must be planted. Toronto introduced similar legislation back in 2009 and the City of Melbourne has produced guidelines suitable for any government wishing to follow this path. So how does London compare? It’s well known that London is famous for its green spaces. Making up 47% of the capital’s area, the parks, communal gardens and nature reserves are home to over 13,000 species of bird, insect and other wildlife. Even so, London is densely populated, with 8.6 million people in an area of 977 square miles. It’s predicted to grow to a staggering 11 million in population by 2050. More people equals more emissions, so the capital will need even more green areas, such as roofs and walls, to help counteract that effect on the environment. The Mayor’s Air Quality Fund (MAQF) has committed £20 million over ten years to support London’s boroughs and local authorities in the war against air pollution. The money is ear marked for initiatives such as low-emission vehicles and innovative projects aimed at cleaning up our communities to make them greener, more attractive and safer for walking or cycling. In the initial release of funding, the MAQF approved forty projects, including schemes incorporating green roofs and walls. City Hall has clearly stated its support for more, along with the objective of making our business districts greener. > Once planted, a green rooftop provides efficient insulation, protecting from heat in summer and helping to repel cold in winter. They create a habitat for local fauna and a well-considered selection of plants can improve local bio-diversity – often a requirement for new buildings to meet a BREEAM rating. > Green roofs also help to transform carbon monoxide from heating, traffic and other urban emissions into much-needed oxygen for the City’s inhabitants. Plants are also able to clean the air, water and soil from toxins present in emissions. Green roofs can therefore help to lower a property’s carbon footprint. > The value of green roofs is amplified in off-setting the Heat Island Effect of large cities such as London too. The effect of the built environment can lead to hikes in temperatures by as much as three degrees Celsius in the daytime and up to twelve at night. Roof gardens help to reduce this effect through their ability to absorb heat during daylight hours. > Planted walls and roofs also catch rainwater, slowing its flow and drinking it up. This is of considerable value to the local environment, especially in areas where too much rain can overload drainage and sewage systems – a massive bonus in urban areas prone to street flooding. Green roofs are therefore an attractive proposition when included in planning applications. > Last but by no means least; easily accessible green spaces are also great for people to relax in too. Whether they’re residential roof gardens or planted office terraces in the midst of commercial zones, the extra space is simply great to enjoy. There are already over 700 green roofs and walls throughout London. The London Assembly, along with the Green Roof Consultancy (GRC) has launched a green roof map to show their positions, covering a combined total of over 175 000 m sq., or 17.5 hectares. The GRC is currently working on a long-term project in South London, with the aim of creating a green roof strip from one end of Norwood Road to the other. This project will transform the eyesore of largely empty commercial roof areas into an attractive and environmentally functional green space. In the City of London, the City Corporation is committed to introducing more green roofs and walls too. One of the unexpected benefits here is for the City’s Peregrine falcon population, which likes to nest at height. As more rooftop gardens appear so does their number. Planners can be harder to impress when it comes to applications for changes to residential amenity space above ground level. Their concerns are often for the peace and privacy of the neighbours. Will a planted terrace on an upper level mean that the resident will start spying into other gardens? Or have raucous raves into the night? Many councils reap revenue by allowing concerts and other noise-generating events to take place in London’s parks. Their concerns about noise pollution or the disruption of residential peace evaporate at such times. By comparison, how often could they realistically expect a private roof terrace party to be as populated or noisy as a summer music festival? There’s a double standard at work here. We need to work together to fix it. We must change the planners’ way of thinking if we want our residential areas to reflect the London vision for a sustainable megacity. Education on what constitutes noise pollution could be provided, to both residents and local government decision-makers. Neighborly consideration is another topic worthy of promotion. Permissions to create roof gardens shouldn’t be rejected just because residents might want to use them for the occasional gathering. We need to persuade our planners that the benefits of green roofs and walls far outweigh any negatives. They’re favourable to the environment, and are more attractive to look onto than bare brickwork. Is it time to get your own green roof? The great perk of installing a green roof or wall is that you don’t need to have a great deal of outdoor space, or even a garden, to reap the benefits. For small, upper-floor flats, the simple introduction of window boxes will make a difference; they’ll also improve the view. With more support from London’s planners, we hope to see more green spaces popping up around our verdant city. One of them may even be yours. Here at Granit we’re happy to advise you on how, when and what to plant to make your own great outdoors greener. To create your own patch of London’s Grand Green Vision and get it on the map, why not call us or drop us a line? 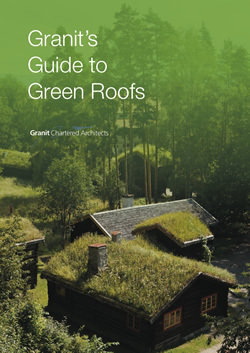 You could also download Granit’s Guide to Green Roofs by clicking here.